The court granted plaintiff's motion to dismiss defendants' FRAND counterclaims for lack of subject matter jurisdiction. "[Defendant's] counterclaims . . . request the Court to find that [plaintiff] has not offered a FRAND rate to [defendant] and for the Court to determine what FRAND license terms would be. . . . [F]or a district court to take up a declaratory judgment suit the court must be 'convinced that by its action a useful purpose will be served.' . . . The Court is far from convinced that the trial that would be necessitated by the declaratory judgment would serve any useful purpose. First, even if the Court were to determine a FRAND rate, I am unclear as to how I could actually enforce such a ruling. . . . All the Court's determination of a FRAND rate would accomplish would be to give a data point from which the parties could continue negotiations. . . . Second, the determination of a FRAND rate would not lead directly to a patent license as multiple other license issues would still need to be negotiated between the parties, any one of which could become a sticking point. . . . [E]ven if the Court were able to determine the FRAND rate in an efficient manner, which the Court finds highly dubious considering that there are 500 or so possibly relevant patents, the Court's FRAND finding would have little utility and serve little to no useful purpose." The court denied defendant's motion for attorneys’ fees under 35 U.S.C. § 285 and rejected the argument that a fee award was justified because plaintiff pursued a damages claim that was "dwarfed" by the cost of litigation. "[Plaintiff's] complaint did not allege [movant] had knowledge of the [patent-in-suit] prior to the lawsuit, so [plaintiff's] potential recovery against [movant] was limited to [about] six months. . . . [Movant] also informed [plaintiff] that [it] had instituted a rebate program for its customers, thereby reducing any revenues that could have formed a royalty base. . . . [Plaintiff] entered into settlements with the carriers and handset manufacturers who sold or manufactured the majority of the [movant]-enabled devices, leaving only four devices and a single wireless network. . . . The main thrust of [movant's] argument appears to be that [plaintiff] should have dropped the case, or entered into a settlement, because the potential recovery from [defendant] would be dwarfed by the costs of litigation. . . . [E]ven if the amount of damages were small relative to the cost of litigation, which seems likely based on the arguments of the parties, the Court is unaware of any de minimis exception for infringement. It cannot be the case that a plaintiff may be subjected to monetary sanctions for failing to drop a case against a defendant if the cost of litigation exceeds the potential recovery." Following summary judgment of noninfringement, the court denied defendant's motion for attorneys’ fees under 35 U.S.C. § 285. The court rejected defendant's argument that plaintiff should have conceded infringement following claim construction because such a concession would have affected plaintiff's appellate rights. "To hold that [plaintiff] had to give up its infringement suit after claim construction and prior to the trial court’s adjudication of the infringement claim would put future plaintiffs in an untenable position. Early claim construction, performed separately from summary judgment, is a common practice in patent cases. These claim constructions, issued separately from other motions, do not analyze issues of infringement or validity. Without such an analysis, an appellate court cannot properly exercise its appellate jurisdiction. An adverse claim construction issued apart from a case-dispositive motion would therefore put future plaintiffs at the mercy of defendants — plaintiffs would be unable to pursue a case-dispositive order and therefore a suitable record for appeal without risking an award of attorney fees." The Board sua sponte ordered that the terminal disclaimer filed in the patent owner's application for the challenged patent be held in abeyance, and that the challenged claims in the instant proceeding continue to be given their broadest reasonable interpretation. "It is not feasible, at this late stage of the proceeding, to change the standard by which the challenged claims will be interpreted, as all of the arguments and evidence we have before us have applied the broadest reasonable interpretation standard. Changing the claim interpretation standard would require us, in essence, to start this inter partes review over again. We determined whether to institute a trial based on the broadest reasonable interpretation standard, Petitioner argued that the challenged claims are unpatentable based on that standard, Patent Owner argued that the challenged claims are patentable based on that standard, and both parties’ declarants applied that standard. If we now were to reverse course and apply a different claim interpretation standard, new briefing, new declarant testimony, and new depositions would need to be completed based on the new standard, and all of the resources expended by the parties and the Board to date would be wasted." In a final written decision, the Board granted in part the patent owner's motion to amend claims. The Board allowed 18 of 19 substitute claims and cancelled the original claims 1-26. "The evidence cited by Patent Owner demonstrates that even small changes in structure can change the biological activity of an insect repellent. Because the prior art does not provide a reason to modify isolongifolanone to arrive at the modified isolongifolanone compounds of proposed claim 27, nor does it provide a reasonable expectation that such modifications would result in a compound having the desired insect repellent activity, we conclude that the preponderance of the evidence supports the patentability of claim 27. As to dependent claims 28-44, because those claims incorporate all of the limitations of claim 27, they would be patentable for the same reasons." The court granted defendant's motion to compel plaintiff to produce a third set of infringement contentions addressing the doctrine of equivalents and rejected plaintiff's "footnote approach." "Plaintiff's contentions contain a footnote explaining that if a claim limitation bears the 'E' designation, then 'to the extent any of those limitations is not found to be literally present, the same acts/structures described are at least the equivalents of the required limitations for the same reasons because they perform substantially the same function in substantially the same way for substantially the same result.' Plaintiff defends that 'footnote approach,' arguing that PLR 3-1 (e) only requires it to disclose 'whether each limitation of each asserted claim is alleged to be literally present or present under the doctrine of equivalents.' Plaintiff reads the requirement too narrowly. 'The Patent Local Rules require a limitation-by-limitation analysis, not a boilerplate reservation. The doctrine of equivalents exists to prevent 'a fraud on the patent.' It is not designed to give a patentee a second shot at proving infringement '[t]o the extent that any limitation is found to be not literally present.' Therefore, the footnote approach is insufficient." The court denied plaintiff's motion to compel the production of all settlement and license agreements for the same technology field as the accused products. "[Plaintiff] argues the license agreements are relevant to the second factor of the Georgia Pacific analysis which requires discussion of the rates paid by the licensee for the use of patents comparable to the patent-in-suit. . . . However, [plaintiff] provides no substantive support for this argument. Instead, it generally states that because certain license agreements are mentioned in [defendant's expert report from a prior lawsuit], they are relevant to the litigation. . . . [T]he Court finds this request for all patent license and settlement agreements for stent-graft technology to be overbroad. [Defendant] has already provided the documents related to the Accused Products." The court denied plaintiff's motion to vacate a claim construction order following settlement. "[Plaintiff] wants me to vacate the claim construction order, in which I adopted only one of its proposed constructions out of nine terms to be construed, because it is concerned about the potential collateral estoppel effects of my order in two actions pending before [another court]. . . . I am not going to relieve [plaintiff] from the consequences of its litigation strategy. It could have asked me to delay claim construction to wait for [the other court's] ruling. It is not lost on me that if I had ruled largely in [plaintiff's] favor, [it] would have trumpeted my rulings before [the other court]. Nor did [plaintiff] have to settle after I ruled. Further, I doubt that [the other court] needs me to erase history that [plaintiff] wishes did not exist in order to reach an appropriate determination in his cases. . . . [A] court should not chisel out parts of the public record and the body of law merely because an unsatisfied party wants to destroy the remains of its loss." Docket Navigator now offers free Courtesy Subscriptions to in-house counsel. 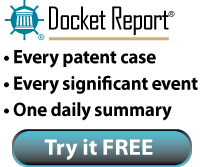 With this new program, in-house counsel can receive the popular daily Docket Report® for free. Courtesy Subscriptions also allow access to Docket Navigator's database, where all the information seen in the Docket Report® is stored. If you are in-house counsel for an operating company that has been accused of infringing a patent in at least one lawsuit, then you need Docket Navigator – for free! The court denied plaintiff's counsel's motion to withdraw with its client's consent, due to plaintiff's inability to pay its fees. "This court is quite sympathetic to the idea that attorneys ordinarily should not be made to work for free. But here two key factors weigh against granting [counsel's] withdrawal request. First, no other attorneys have appeared for [plaintiff]. . . . Second, trial is upon us. . . . And rescheduling the trial would simply shift the burden to [defendant], which hardly would be fair. With great reluctance, and full appreciation of the sacrifice required by counsel, the court must deny the motion to withdraw." The court granted defendants' motion for a unilateral prosecution bar against a NPE plaintiff in the parties' protective order. "A unilateral prosecution bar is appropriate in this case. . . . The possibility of future product plans potentially being contained in the confidential information is not sufficient to impose a prosecution bar on defendants’ counsel. [Plaintiff] also argues that a unilateral prosecution bar is nonsensical because its attorneys do not prosecute patents. The fact that the prosecution bar on [plaintiff's] counsel may end up being moot does not mean a similar bar should be placed on defendants’ attorneys. The parties in this case are not similarly situated. Since [plaintiff] does not currently sell any products, there is no corresponding risk of inadvertent disclosure and misuse. Therefore, the prosecution bar should be limited to [plaintiff's] attorneys who review defendants’ highly sensitive information." The court granted defendant's motion to strike portions of plaintiff's damages expert's report for improperly relying on revenue sharing agreements. "The revenue sharing agreements are contracts for 'app' developers to list their software on [defendant's] Store or agreements for splitting advertising revenue with third-party advertisers. [Plaintiff] argues these agreements are relevant to show 'how [defendant] splits the benefit of the invention with partners.' What [defendant] shares with [a nonparty] for Angry Bird downloads or for advertisements on partner websites has no bearing at all on predicting how much of the incremental profits [defendant] would share with [plaintiff] for a bare, non-exclusive license covering part of a location platform that [defendant] develops itself." Following the filing of the proposed interrogatories, the Board denied the patent owner's request to file a motion for additional discovery. "Patent Owner requested, based on the information provided in the patent owner preliminary response, the filing of a motion for additional discovery to seek information on whether Google Inc. is a real party-in-interest for the Petitioner. . . . We have considered Patent Owner’s proposed interrogatories, and find that they are not 'focused' as was represented by counsel for Patent Owner in [an earlier conference call]. For instance, the interrogatories are not limited to questions concerning the filing of inter partes review of Patent 6,738,799, but refers generally to challenges of invalidity of Patent 6,738,799 anywhere. Also, with regard to payment of money, the interrogatories inquire about payments by entities other than Google Inc., and ask about payments by Google Inc. not necessarily related to the filing of the petition in this proceeding . . . . It is ordered that Patent Owner is not authorized to file a motion for additional discovery which includes the proposed interrogatories submitted [yesterday]." The court granted defendant's motion to stay pending CBM review as to only 1 of 3 patents-in-suit because the lack of potential simplification of issues and stage of the case weighed against a stay for the 2 other patents. "[Defendant] chose to seek limited CBM review before the PTAB on a subset of the patent claims at issue. . . . [T]he court is not convinced that the PTAB's review of a subset of claims will simplify, to any meaningful extent, the issues in question or help streamline the trial. Although discovery is not complete, the trial date that is scheduled is within months of when the PTAB is expected to issue its decision. Given the fact that [defendant] has affirmatively asserted its patents against [plaintiff], it is apparent that [defendant] is playing the stay card as both a sword and a shield. . . . [Defendant's] tactics have actually increased the burdens of litigation, rather than reduced them. . . . Despite the presence of Congress' thumb on the scales of justice, the court concludes that a complete stay, under the circumstances at bar, will not simplify the issues or reduce the burdens of litigation." Following an order excluding the report of plaintiff's damages expert, the court denied plaintiff's motion to allow its damages expert to present a "per-user" theory of damages because the theory was fatally flawed. "Where, as here, the accused technologies represent a small improvement to an existing technology, [plaintiff] is only entitled to a royalty based on the incremental value provided by that improvement. . . . Instead, the 'per-user' damages theory (1) calculates the number of people using [defendant's product], (2) multiplies the number of users by the equivalent of one [Dutch] Guilder, and (3) reduces that amount by 80% to account for the fact that the original licenses were for products and not patents. At no point does the 'per-user' damages theory discuss the value of the . . . features that allegedly cause [defendant] to infringe the patents at issue. Thus, the 'per-user' theory is fatally flawed [and] claims damages 'far in excess of the contribution of the claimed invention to the market' and thus claims 'more than the damages adequate to compensate for the infringement.'. . . [Plaintiff's expert's] 'per-user' theory does not take into account the value of the asserted claims by focusing on the asserted features." In connection with defendant's motion for attorneys' fees under 35 U.S.C. § 285 and 28 U.S.C. § 1927, the court granted defendant's motion to compel the production of communications between plaintiff's litigation counsel and plaintiff's prosecution counsel, because the crime-fraud exception deprived plaintiff of any privilege as to the documents. "This court has found, and the Federal Circuit has affirmed, a series of false representations of material fact relating to invention, demonstration, actual reduction to practice, and diligence. . . . [Defendant] has obtained by subpoena from [prosecution counsel] an e-mail exchange between [plaintiff's owner/inventor] and [prosecution counsel] [7 years ago]. The communications clearly reveal [plaintiff's owner's] awareness of false content in a filed declaration and instruct [prosecution counsel] to confer with [litigation counsel] about the matter. This exchange alone warrants the document discovery sought and deprives [plaintiff] of any attorney-client privilege. The fact that [litigation counsel] now state that they were unaware of the [7 year old] communications between [plaintiff's owner] and [prosecution counsel] and contend that [prosecution counsel] did not communicate with them about the false declaration filed with the PTO is not relevant to the question of whether [plaintiff] has an attorney-client privilege. The loss of the privilege depends upon the wrongdoing of the party, not the conduct or knowledge of the lawyers." The court granted defendant's motion to exclude all opinions of plaintiff's damages expert because of his failure to account for defendant's contractual right to license the patents-in-suit for around $2 million. "[Plaintiff's expert] explained that he found the [parties'] agreements to be irrelevant because [defendant] did not actually license the patents-in-suit. . . . His failure even to consider the [parties'] agreements based on his 'sense of fairness' renders his opinion unreliable. . . . Although [the parties'] agreements do not necessarily 'demonstrate the upper limit' of [plaintiff's] recovery, '[t]hey clearly ha[ve] a substantial bearing on the reasonable compensation to which [the patentee] was entitled for infringing use of the invention.'. . . . Of crucial importance here is the fact that [defendant] had an offer from [plaintiff] for a license to the patents-in-suit for a maximum of about $2 million. . . . [Plaintiff's expert's] failure even to account for the reality that at one point [plaintiff] was willing to license all of [defendant's] alleged infringement - and obviate this litigation - for a cap of about $2 million, and the absence of any reasonable explanation for why this reality is irrelevant, renders his analysis unreliable." The court denied plaintiff's motion to reconsider the court's prior invalidity finding because of the PTAB's different findings during inter partes reexamination and determined that the parties' breached their duty of candor by failing to inform the court of the pending IPR for six months. "By failing to advise this Court of the existence of the IPR proceedings, [the parties] in effect had two bites at the apple regarding the validity of the disputed claims. Moreover, they deprived this Court of the opportunity to inquire of the parties and decide for itself whether to await a ruling from the PTAB on that issue. . . . However, in light of the undeveloped state of the law on this relatively new PTO review procedure, this Court's admonition of all counsel involved in this case falls short of a formal reprimand of any of the individual lawyers. That said, the issuance of this Opinion is more than sufficient to place all patent practitioners on notice that future failures to disclose to the Court any concurrent inter partes review proceedings will be met with far sharper consequences." The court ordered the parties to resubmit jury instructions after finding that they were over-litigating the case and warned that arguments in chambers may be charged against trial time. "The parties’ continual expansion of the remaining issues in dispute retroactively waste the substantial resources the Court has committed to resolving the multitude of disputes the parties have presented. Good, experienced jury trial lawyers know their job is to bring order out of chaos, and simplicity out of complexity. . . . This case is being over-litigated, particularly considering the amount involved. . . . [J]ury instructions are not the place to frame a party’s view of the case or argue it to the jury. That is what opening statements and closing arguments are for. The Court orders the parties to materially reduce the number of jury instruction disputes. . . . To assure a more effective presentation of the case to the jury, the Court may decide to charge time it spends resolving arguments in chambers against the time allotted to the parties for the trial." The Commission affirmed the ALJ's finding that respondents' digital data sets electronically transmitted to the U.S. constituted an article of importation. "[Complainant's] infringement claims concern respondents' digital datasets and treatment plans representing the initial, intermediate, and final positions of patients' teeth for use in fabricating dental appliances for orthodontic treatment of individual patients. The Commission therefore must determine whether the phrase 'importation ... of articles' as used in Section 337(a)(1)(B) encompasses these digital data sets that are electronically transmitted into the United States. . . .'Articles' is not explicitly defined within Section 337. . . . [T]he Commission finds that the intended meaning of 'articles' encompasses such items as are bought and sold in commerce and that are imported into the United States, regardless of the mode of importation. . . . [T]he meaning of 'articles' is intended to encompass imported items of commerce as to which a finding of infringement of a patent, trademark, copyright or protected hull design may be sustained (provided that all other requirements of the statute are met). . . . [T]he fact that Customs enforces exclusion orders issued by the Commission by excluding from entry physical goods passing through U.S. ports does not limit our understanding of the scope of 'articles.'" The court ordered the parties to submit supplemental simultaneous briefing regarding defendants' motion for attorneys' fees following the recent Supreme Court decisions in Highmark Inc. v. Allcare Health Management System, Inc., No. 12-1163 (Apr. 29, 2014) and Octane Fitness, LLC v. Icon Health & Fitness, Inc., No. 12-1184 (Apr. 29, 2014).